WTP The Furniture Company is a small firm by most standards, but it has big dreams. The 25-man outfit with sales under $5 million last year is hungry for business, and has set out a plan to get it. Known for its high-end custom-made and designer furniture pieces, the company now wants to expand aggressively with a more pocket-friendly range called The Outlet, which it officially launched last month. Owner Naseem Mimi Somjee says with gusto of WTP's move: "We want to tell everyone we have been around 21 years. We can do this, give us the volume now so we can live!" Ms Somjee's drive to raise sales volume at WTP comes amid the government's productivity push, and highly challenging business conditions. "To be a retailer in Singapore is tough work. One, because rentals in Singapore are very high. Our wage bill is going up. There are no freebies for us. And the market is very price-sensitive today, so your prices cannot go up, but costs are going up. "So what do you do? Some compromise on quality. We are trying not to compromise on quality, so we have to be more innovative in our products, and cleverer in our sourcing and manufacturing," she says. The government has been encouraging companies here to automate more to raise productivity - something that Ms Somjee wants to embrace. "In order to do that, in order to live, I have to expand. I have to have quantities of scale," she says. WTP's budget range of furnishings is not new to the company. What's new is its plan to market it aggressively or, in the words of Ms Somjee, to "formalise it so that people can see it". "My job is to make sure that we can fit any budget. The Outlet is here to satisfy the aspirations of the people who want to buy WTP stuff, but thinks it is too expensive. We want to give them value within their price bracket," she says. The pieces under The Outlet will bear the style of their cousins in the high-end range, but can cost just half the price of the latter. Customisation options are also available, and quality will remain high - though not at the levels of the upper range products. Ms Somjee puts it this way: "We still haven't gone into the chipboard stuff. It is still good quality wood but instead of say, being a 5cm thick table top, we are doing 3cm so that we can bring the price down." Apart from selling the pieces in the retail market, Ms Somjee hopes that The Outlet will see strong leasing demand, in particular from companies that are providing accommodation to foreign employees moving temporarily to Singapore for work. This is especially given the shrinking packages that companies now offer to these employees. She believes leasing demand will be key to The Outlet's success. WTP already runs a leasing business for its high-end range, and caters to both long-term and short-term leases. "Corporates need to look more into leasing rather than giving their employees a budget to buy. It's much more cost effective, especially if a person is here just two or three years, because at the end of the lease you can return the furniture." The returned pieces are not thrown away. WTP refurbishes and reconditions them for its short-term lease market - where furniture is rented out for days, weeks or months. For long-term leasing, new furniture are used. Ms Somjee says that it can cost as little $500 to rent brand new furniture from The Outlet to furnish a two-bedroom home. "So it makes a lot of sense (to companies), but we need volume to be able to give these rates. So we are looking for companies to give us this volume." WTP also works with clients so if the pieces of furniture break down, it will "take care of it". says Ms Somjee. This creates less hassle for clients. Design consulting services, which gives clients some room to customise the pieces, are also made available even to its leasing business - and yes, to the pieces under The Outlet. On top of leasing to corporates and their foreign employees, Ms Somjee also believes that landlords should consider leasing furniture for their investment properties. Her pitch: "It is a tenant's market today. It is no longer a landlord's market. A tenant goes out looking at houses, and after a while they all merge into one because they are all empty and the tenant can't visualise because they all look the same. "So what we are saying to landlords is this: Come to us. With an inexpensive budget, we will furnish and stage your unit. You can get 20-30 per cent more rental, so your yield will go up, and it's affordable." But can WTP and its budget range survive with the slashed prices? Ms Somjee believes so. She says that it can sell and lease out pieces under The Outlet at good rates because the company manufactures some of its own stuff, and works with partners it has known for years. WTP has four people in Singapore making its pieces, but most of the work is done overseas. It has a factory in Indonesia's Central Java with five employees, and collaborates with long-time partners in Vietnam, Thailand, China and Indonesia. Much of the work is done by its partners. "We try and see who is the best and cheapest in the field, and work with those people." Owning its current premises at Kung Chong Road also works in WTP's favour to manage pricing for its furniture, because it takes escalating rent out of the equation. But the local market is not big enough to sustain sales volume even with the launch of The Outlet, and Ms Somjee realises this. "In order to scale up, I need to look for bigger markets because our market here is not big enough. "How am I going to do that? I am hoping that Singaporean companies that are going overseas - developers, and contractors - will employ me. I hope that they will come and hold my hand and take me with them. So moving forward that is the direction I am intending to head towards, to get more people to hold my hand," she says. WTP has spoken to developers about such collaborations, and is currently helping one private developer here to furnish a project in India. She believes that Singapore needs to grow a strong mentoring system, where bigger companies help smaller entities by providing advice to them and collaborating with them. The mentorship culture is firmly in place in countries such as Japan and Korea, but is lacking here. "I think that this mentoring system that we see in other places is needed here. We need to have a mentoring system for SMEs because if you are an SME, you have been alone a lot, and trying to survive. That is why you have not gone into the big league. We need to link up with people who have done it, made it from an SME to a big company, and are willing to share their ideas and experiences. "Right now it's tough, it's really tough," she says. Conditions have gotten a lot more difficult in the last few years, as Singapore undergoes a painful restructuring process. WTP has been trying its very best by innovating and providing value-added services to keep its business alive. It covers everything from selling and leasing furniture, and helps clients with interior designing. 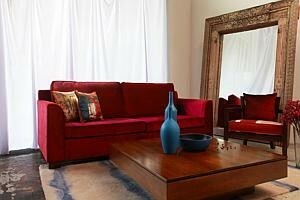 It also runs what can be considered a concierge service for clients of its high-end furniture pieces. "I have done everything including buying mops, pails, pots and pans," says Ms Somjee. "So we have stretched ourselves." But like many in the SME community, the company is facing a lot of difficulty trying to cope with the manpower crunch. Ms Somjee says: "Provide me with the Singaporean and I will employ him, no problem. You put out an ad and 99.9 per cent of the time, it is the foreigners who apply. If they (Singaporeans) want to be an accounts clerk, they want to be in a multinational. It's very tough for SMEs." But Ms Somjee is not one to concede defeat despite the challenging market conditions. Her approach to life is simple. She says: "God throws you a challenge. You either pick up the ball and run with it, or you drop it.